Those who know it grow it. 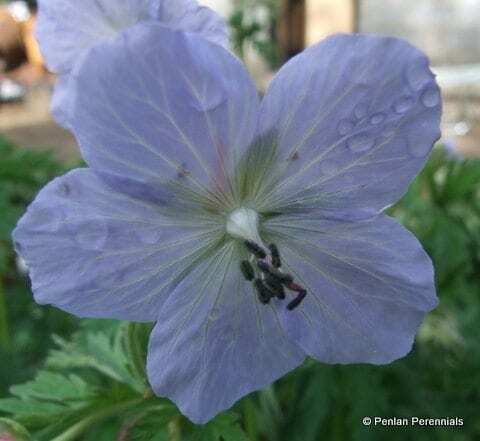 This lovely geranium has the palest blue tinged white open flowers with contrasting black anthers, appearing luminous in evening light. The mound-forming foliage forms a large clump, with mid-green, jagged lobed foliage. Good in full sun or partial shade, it grows best in well drained soils. Large clumps can be lifted and divided in spring. Easy, ultra hardy and pest and disease resistant. A superb meadow cranesbill. Cut back all foliage to the ground in spring. Propagate by careful division. Seedlings often come true, but you will get some lovely variations.